The Zig Zag rolling trays serve their purpose perfectly. This rolling tray is perfect size. Big enough to hold your supplies yet small enough to be a travel companion. The edges are designed with extra height and rounded corners to ensure no tobacco gets stuck anywhere. Grab your favorite pack of rolling papers, a good blend of filler, and this rolling tray and start making some smokes. Zig Zag is one of the most popular and well-known rolling paper brands, making them legendary in the smoking world. Zig Zag has been around for over 100 years and maintains their reputation with consistency and quality. 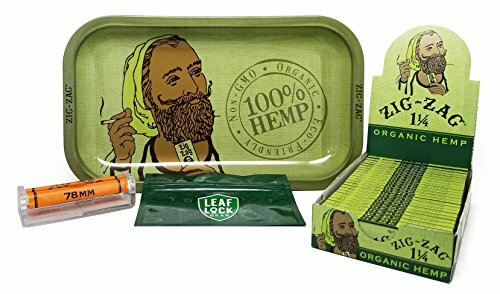 Zig Zag Organic Hemp 1 1/4 Rolling Papers are an extremely thin rolling paper made from unbleached hemp that was harvested from organic farms in an environmentally friendly manner. These papers burn nice and slow and give you less of a paper taste when smoking and are an environmentally friendly option for the smoking connoisseur who doesn't want to hurt the planet in the process! These premium papers are 100% renewable and gives a conscious smoking experience for the discerned smoker. Zig-Zag has been in the business for a long time, and they know how to make a great rolling paper, and that quality extends to their rolling machines! These rollers make an even and consistent smoke every time. Leaf Lock Gear Smell Proof Pouches are Odor-Tight and Water Tight. With a tight locking zipper top and reinforced seams around the edges, these are the only bags you'll want to use. If you have any questions about this product by Zig Zag, Leaf Lock Gear, contact us by completing and submitting the form below. If you are looking for a specif part number, please include it with your message.